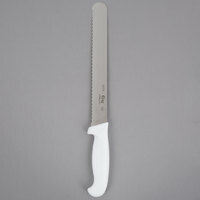 Cut meats with precision with this Choice 10" serrated edge slicing knife. This knife's serrated edge is perfect for slicing tomatoes, sausage, and bread. This edge allows for fast, easy cutting and helps prevent crushing or crumbling delicate products. Plus, the ergonomic polypropylene handle will provide exceptional comfort and a safe, non-slip grip as you tackle daily food preparation tasks. For additional peace of mind, this knife features a protective finger guard to keep your hands away from the blade while in use. I am in receipt of the 10" Serrated / Wavy Edge Bread and Sandwich Knife and it is a solid serrated knife. It will easily cut through your thin sandwiches and thick large subs. The handle is comfortable in hand, and the blade is corrosion resistant. A beautiful knife at a decent price. Great knife for the money. Hold up well, stays pretty sharp. We only use it for bread but it get the job done. Would recommend. These are good for bread and fruit but that's about it. They don't come very sharp but not a big deal. These are going to last 3-4 months. This is a nice, sharp serrated knife. We use it to slice crunchy baguette in our wine bar. It stays sharp and the handle is easy to hold. This knife works great for slicing the large miche we use for our bread baskets! It's a large piece of bread, so we needed a large knife to do the job. Works great! Great knife. This serrated knife is very durable and sharp. We use it for many applications including cutting dough and doughnuts. The price is amazing. This is a great all purpose serrated knife. I use it on anything from French bread to tomatoes. It is pretty durable given the price. I am pleasantly surprised. good product, the curves (i dont know how to explain each small curved piece or blade of the knife!!) are a little bit spread , i would preferred them a little bit closer so it cuts better, but overall a good product. Good balanced knife for quick even slicing of our homemade sandwich bread. Well priced since we need a bunch of them. Stays sharp so you don't need to sharpen it all the time. The nice thing about these Choice knives is the cost factor. Are they the best knives you will ever use? Of course not. But, working in a commercial setting you want consumable tools available. You do not want to use your high end knives for all manner of things. And thus, that is where these Choice knives come in. Great product for the money, and when one is no longer usable, or grows legs and items so often do in a commercial kitchen, you can replace it without breaking the bank. Highly recommend. These knives are the best serrated we have used at a FANTASTIC price. They are perfect for sandwiches, slicing back and forth through the top piece of bread and then sharp enough to press hard through the rest. We have several and wouldn't go without them. This is a great bread knife. It cuts through bread easily without squishing the bread. The handle is easy to grip and comfortable. I would recommend this product. This bread knife is great for cutting bread, does its job well, and is pretty inexpensive. I would say this is a good deal for your money. This is a rather large but sturdy knife. It is reliable and very durable. The blade is very sharp and firm. It cuts easily without tearing. It is great for everyday use in any restaurant. These knifes have so much versatility at an absolutely unbeatable price! Will use them for almost everything in the kitchen from cutting bread and sandwiches to slicing tomatoes. I definitely recommend adding a few to your arsenal. This bread knife feels great in your hand, and cuts bread easily. The poly handle is non slip and very comfortable, and the high carbon steel is hardened and holds a very sharp edge. I also love that the knife is dishwasher safe. We bake artisan bread loaves to pair with our dipping oils. The artisan bread can a have a good crust, so we love the power of this knife to cut through. The 10" blade is great for our wide sourdough bread. Love this knife. The handle is comfortable, it cuts quick bread well, and it's dishwasher safe. The 10 inch blade is the perfect length, and you can't beat the price. These knifes are amazing very lightweight very easy to use and cut so easily the knife just slides into meat very happy will buy again. I have to have lots of these knives in the drawers at our bakery. We make loads of banana bread and these are our favorite knives to cut the loaves into slices. Great knife! It gets the job done quicker than I expected. The blade is very sharp! The handle is easy to grip and fits comfortably in my hand. This worked perfectly for our use. It is long and sturdy. I like that the handle is polypropylene which means I can sterilize the knife and not worry that the handle will absorb anything I'm working on. Great knife with a beautiful finish and sharp blade that makes cutting my piled high sandwich quick and easy. Cleaning is very easy and it maintains its appearance. Nice! Mine was "Update" branded which, like my other Update items, works well and seems to be of good quality for the price. Cuts ripe tomatoes and bread quite well. A great value. Nice, sharp knife. Slices smoothly. We will be using this one as our staple bread knife now. Great knife for the price! Will purchase again. I use this knife to level cake layers and it does the job perfectly. It's sharp and obviously a great size even for large cakes. The prices can not be matched and the quality is great. Purchase the inexpensive handheld knife sharpener to keep these knives sharp for years. Excellent buy! I thought 10" would be a bit long for a bread knife but turns out it is just about the right length. This will come in handy for slicing bread and perhaps the occasional melon as well. The serrated edge came plenty sharp. The handle is quite large and comfortable. The handle also provides for a very secure grip - I am not sure if it is the texture or material but I like it. Love this knife! Just the right size for slicing sandwiches and breads. Goes through them like butter without tearing or mashing up the bread. It's my personal knife in the kitchen! This is a great bread knife to use for any type of bread. It's sharp, and the long blade is great for cutting bread loaves. Wonderful knife. I bought it specifically for layering cakes, but have found it works incredibly well in cutting hot thick sandwiches, and other things (layered cakes!) where minimal slippage is mandatory. This is a great basic serrated knife! It is great for slicing hard breads! Nice long blade makes it much easier to make consistent cuts!! This knife is very good quality for the price. We use it to level cake layers, and the blade is strong and the serrated edges are sharp. Great knife! Great knife for the money. The knife is durable and has a very solid handle. Made of quality materials that last. These knives usually last about 9-12 months before we need to replace them. This knife is great for our purpose. We use it to slice frozen cakes and to split them. It cuts clean and easily and fits through our largest cakes.